I don't understand what this is? Is it a pie crust? It's amazing what some heat can do to sugar, molasses and butter. 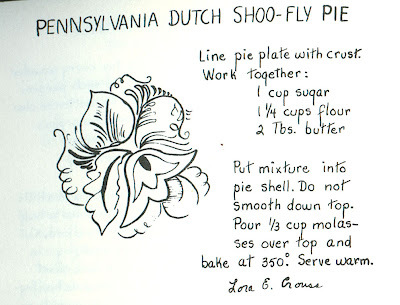 I've never had shoo-fly pie and I'm sure it'd send me into a coma right away, but it sure sounds good! I love your blog, by the way! It's such a fount of useful information. I think this recipe is missing a thing or two, especially the crumbly topping. Morta, it's a filling you put in a pie crust. Traditional Shoo Fly pie out of the Pennsylvania Dutch region has a wet bottom (the molasses mixture) topped by a crumb-cake type topping. Often called wet-bottom shoo fly. It's delicious and my Dad's favorite next to lemon meringue. This recipe is totally incomplete. Don't use it. This is totally wrong. Shoofly pie has a crust that you boil first, its a molasses based liquid(I use 2 Tbsp blackstrap to a cup of corn syrup), otherwise its way too strong). You add the filling to the crust. You then mix up the crumbly topping and float it on the top of the pie. A lot of it will sink but mostly stays on top. Then you bake it. In my family, you have achieved shoofly perfection if you achieve "gooey bottom" to the pie. That means no overbaking, when the top of the pie cracks, you know its about right.